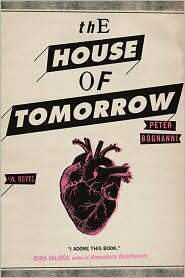 While slowly falling under the winsome spell of sixteen-year-old Sebastian Pendergrast, the main character in The House of Tomorrow, I made a crack about how an author could increase the chances of me liking his/her book by 38% merely by mentioning The Replacements. Author Peter Bognanni didn’t need the ‘Mats bump. His coming of age tale about a young, home-schooled boy discovering the joys of the world outside his grandmother’s geodesic dome is a charming mix of intelligence, innocence, and earnestness. You have to fight pretty hard not to be won over. Sebastian is thrust into the world (the world in this case being a small town in Iowa) after his grandmother suffers a stroke. Lucky for him, the day Nana keels over, Janice Whitcomb and her son, Jared, are touring the dome. The Whitcombs accompany Sebastian to the hospital and wait with him to hear Nana’s prognosis. Jared, a chain-smoking kid who is recovering from a heart transplant introduces Sebastian to punk rock music. And even when Nana semi-recovers, Sebastian decides to strike up a friendship with Jared. After a misunderstanding, Sebastian is cast out of the dome by Nana and goes to live with The Whitcombs (a broken family that includes an estranged father and the promiscuous Meredith, Jared’s older sister). Of course, Jared and Sebastian start a band and slowly, Sebastian begins to realize what he’s been missing out on while being sequestered away in the dome — grape drink, friends, Pop Tarts, The Ramones, Meredith. The House of Tomorrow unwinds slowly, carried forward on the strength of Sebastian’s unique voice. A good voice can go a long way, and Bognanni is true to it through out. It’s awesome. Sebastian’s naivete and his awareness of it are a charming combination. Watching him experience things like soda pop and ordering food at a restaurant for the first time is both painful and fascinating. The book is filled with all kinds of these scenes that are both funny and painful at the same time, and I never got tired of reading them. What I like so much is that the plot unwinds slowly on the strength of Sebastian’s voice and you’re eventually enveloped in the story to the point where you feel real fear and sadness when it comes to the precarious health of some of these characters. There were times while reading the book that I was actually afraid. But, as much as I enjoyed the journey through The House of Tomorrow, the ending was really unsatisfying. The last twenty or so pages devolved into a slapstick 80s teen romp. Sort of like that scene in “Some Kind of Wonderful” when all the punks invade the preps’ party. Bleh. The very end is a little too loosey goosey for my tastes, it felt really unresolved. Lucky for Bognanni, the first three-hundred pages are so good that even though it ends on a weak note you don’t even care because the rest so damn fun. jodi, i swear i’m not submitting reviews because i’m always reading the same books you are! You should submit them anyway!